Humanitarian Engineering – Intersections between the National Academy of Engineering’s Grand Challenges, and the United Nations’ Sustainable Development Goals. Renetta Tull is Associate Vice Provost for Strategic Initiatives at the University of Maryland, Baltimore County (UMBC), and Professor of the Practice in UMBC’s College of Engineering and IT. She is also Founding Director and Co-PI for the 12-institution National Science Foundation University System of Maryland’s (USM) PROMISE AGEP, and Co-Director/Co-PI for the NSF USM’s Louis Stokes Alliance for Minority Participation (LSAMP). In addition to roles at UMBC and roles with grants, she is also part of the University System of Maryland’s Academic and Student Affairs unit in Adelphi, Maryland, serving the USM as Special Assistant to the Senior Vice Chancellor for Academic Affairs, and USM Director of Graduate & Professional Pipeline Development. Tull earned the BSEE from Howard University, and the MSEE and Ph.D. in Speech Science from Northwestern University. Her work in speaker recognition and focus on disability access to technology led to her former faculty and “Engineering Research Center Faculty” roles at the University of Wisconsin-Madison, and the Quality of Life Technology (QoLT) Center at Carnegie Mellon/University of Pittsburgh respectively. An international speaker on global diversity in STEM, Tull has led discussions such as “Inclusive Engagement – Engineering for All,” “Cultivating Inclusive Excellence within Science, Engineering, and Technology,” and similar topics in India, Taiwan, Korea, Dubai, Italy, and Australia. She has also spoken in 5 countries in Latin America about women and work/life balance, family, and prevention domestic and work-place abuse. She co-led Puerto Rico’s ADVANCE Hispanic Women in STEM project, and continues to lead the “Women in STEM Forum” for the Latin and Caribbean Consortium of Engineering Institutions (LACCEI) and the Engineering for the Americas/Organization of American States. Recognitions include: 2015 O’Reilly Media “Women in Data” cover, 2015 Global Engineering Deans Council/Airbus Diversity Award Finalist, and the 2016 ABET Claire L. Felbinger Award for Diversity. She has been an invited plenary panelist for diversity in engineering initiatives for the 2016 International Conference on Transformations in Engineering Education in India, and the 2017 Women in Engineering ProActive Network (WEPAN) conference. She was a 2017 invited speaker for UNESCO’s “Women in Engineering” forum at the United Nations, and an invited speaker for the International Federation of Engineering Education Societies (IFEES) “Global Engagement in Diversity” webinar. Tull is active in the American Society for Engineering Education, has more than 50 publications, has given more than 200 presentations on various STEM topics, and is a Tau Beta Pi “Eminent Engineer.” In 2016 and 2017 she was named in Medium.com’s “35 of Women STEM Social Media Stars/Women in Science You Should Be Following On Social Media,” and “List of 200 Women of Color on Twitter,” respectively. 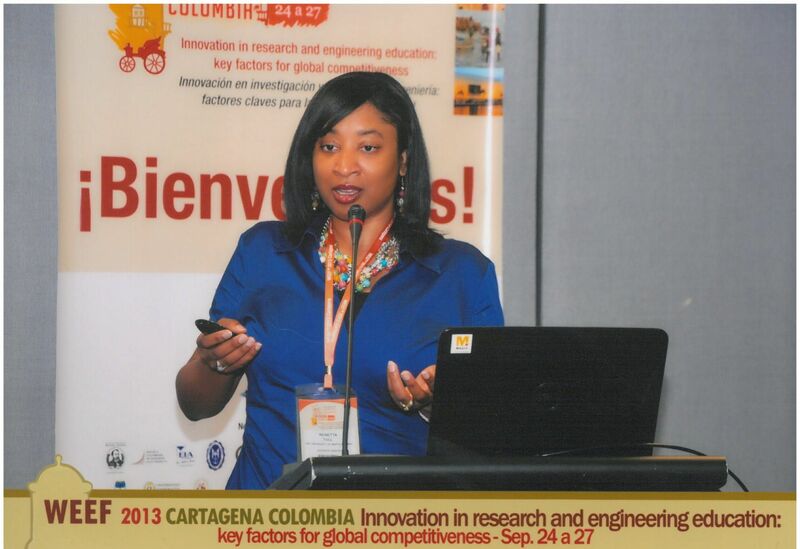 In July 2017, after a bilingual presentation, Tull was elected Vice President of Initiatives for the Latin and Caribbean Consortium of Engineering Institutions (LACCEI), at the annual international conference. In 2018, she is serving as the University System of Maryland’s Chair for the Health Care Workforce Disparities Group, and is honored to be serving the National Academies of Sciences, Engineering, and Medicine as a member of the national mentoring committee. She also serves the United Nations Educational, Scientific, and Cultural Organization (UNESCO) as a 2017-2018 team member for the next international engineering report. She is a passionate advocate, global mentor, and champion for equity in STEM; she invites you to engage on Twitter @Renetta_Tull #ThinkBigDiversity. An effective administrator with research interests in international STEM education, America’s competitiveness, and equal access to higher education. Technical interests and work are in the areas of speech related applications to medicine, engineering and technology; interests also include accessible technology resources for persons with disabilities. Diverse work and leadership skills are demonstrated through experience with universities, technology councils, Fortune 500 and start-up companies, medical facilities, and government projects. NORTHWESTERN UNIVERSITY, Evanston, Illinois, Ph.D., Speech Science, 1999. Dissertation: Acoustic Analysis of Cold-Speech: Implications for Speaker Recognition Technology and the Common Cold. HOWARD UNIVERSITY, Washington, D.C., B.S., Electrical Engineering, 1991. ACTIVITIES OUTSIDE OF THE MAINLAND U.S.
Tull, R. G., Tull, D. L., Hester, S. S., and Johnson, A. M. (2016). Dark Matters: Metaphorical Black Holes that Affect Under-representation in Engineering. American Society for Engineering Education. Paper presented at 2016 ASEE Annual Conference and Exposition, New Orleans, Louisiana. Okahana, H., Allum, J., Felder, P. P., and Tull, R. G. (2016). Data Sources PLUS: Implications for Practice and Research from Doctoral Initiative on Minority Attrition and Completion. The Council of Graduate Schools (CGS Online Publication: http://cgsnet.org/data-sources-plus-implications-practice-and-research-doctoral-initiative-minority-attrition-and). Delaine, D. A., Tull, R.G., Sigamony, R., and Williams, D. N. (2016) Global Diversity and Inclusion in Engineering Education: Developing Platforms toward Global Alignment. International Journal of Engineering Pedagogy, Vol. 6., No. 1. Cortes-Rodriguez, M., Nino, M. A., & Tull, R. G. (2015). Desde la Licenciatura Hasta el Doctorado: Los Sistemas de Apoyos Para Estudiantes de Posgrado en Instituciones Fuera de Su País y Lejos de Casa. Revista Cruce. Reed, A. M & Tull, R. G. (2015) Programmatic Interventions for Developing Diverse Global Eminent Faculty Scholars Through International Collaborations. Paper presented at 4th Annual ASEE International Forum, Seattle, Washington (19.28.1 – 19.28.9). Seattle, Washington: American Society of Engineering Education. Tull, R. G. (2015, March/April). Global exposure: to increase diversity, engineering programs should promote overseas experiences for underrepresented minorities. American Society for Engineering Education (ASEE) PRISM. Tull, R. G. & Cortes-Rodriguez, M. (2015). Starting points for involving underrepresented graduate students in international engagement: a case study on the collaborations between the University of Maryland Baltimore County (UMBC) and educational institutions in Latin America. Paper presented at 4th Annual ASEE International Forum, Seattle, Washington (19.30.1 – 19.30.19). Seattle, Washington: American Society of Engineering Education. Tull, R. G., Williams, A. Y., & Hester, S. (2015). An NSF AGEP Program’s Unintended Effect on Broadening Participation: Transforming “Non-STEM” Graduate Students into Engineering Education Faculty, Researchers, K-12 Educators, and Advocates. Paper presented at the American Society for Engineering Education(ASEE): 122nd ASEE Annual Conference Exposition, Seattle, WA: American Society for Engineering Education. Tull, R. G., Ordóñez, P., Carter-Johnson, F., Zayas, B., Byars-Winston, A., Cortes-Rodriguez, M. (2014). The Jessica Effect: Valuing Cultural and Familial Connections to Broaden Success in Academe, AAC&U Peer Review. Tull, R. G., Medina, H., Pearlman, J., & Goldberg, M. R. (2013). An Emerging Impact from an Engineering Education Outreach Collaborative “Bridge” Program: Graduate Student Participation in Wheelchair Mobility Research for Mexico. #RP207, Proceedings of the Eleventh LACCEI Latin American and Caribbean Conference for Engineering and Technology (LACCEI’2013) “Innovation in Engineering, Technology and Education for Competitiveness and Prosperity,” August 14 – 16, 2013, Cancun, Mexico. Tull, R. G. (2013, Spring) Optimize Your Summer Research Experience. SHPE – Magazine of the Society of Hispanic Professional Engineers. Vol. 15., No. 2. p. 20. Imler, C. and Tull, R. (2012, November 30). Stem Tide of Grad Student Losses. The Daily Record (Baltimore, Md.),p. 19. Tull, R. G., Rutledge, J.C., Warnick, J. W., and Carter, F. D. (2012). PROMISE: Maryland’s Alliance for Graduate Education and the Professoriate Enhances Recruitment and Retention of Underrepresented Minority Graduate Students. Academic Medicine, 87(11), p. 1562-1569. Rutledge, J.C., Carter-Veale, W.Y. & Tull, R. G. (2011). Successful PhD Pathways to Advanced STEM Careers for Black Women in Beyond Stock Stories and Folktales: African Americans’ Paths to STEM Fields, Vol. 11., H. T. Frierson and W. F. Tate, Eds. United Kingdom: Emerald Group Publishing Ltd.
Tull, R. G. (2009, Fall). The ‘Imposter Syndrome’ and How to Avoid it. SHPE Magazine – The Official Magazine of the Society of Hispanic Professional Engineers, Vol. 11, No. 3. Amanuel, Yared, Surface Morphology and Mechanical Properties of a Microwave Plasma Assisted Chemical Vapor Deposited Microtextured Carbide Layer on Co-Cr-Mo Alloy Used for Artificial Joints, M.S., Mechanical Engineering, UMBC, 2007. Alexander, Lauren M., Professional prerequisites for entry-level technical positions, M.A., Intercultural Communication, UMBC, 2007. Dyer, Philip S., SoftSeparator: A method for dynamic separation of the signatures generated by two cows walking in tandem over the longitudinally-split floor of the StepMetrix(TM), M.S., Mechanical Engineering, UMBC, 2007. Siraj, Zaker, Time-varying compression amplification with spectral sharpening, M.S. Computer Science and Electrical Engineering, UMBC, 2008. Briggs, LaTese L., Biophysical analysis of the RFX complex: An essential regulator of the adaptive immune system, Doctor of Philosophy, Chemistry, UMBC, 2008. Bacon, Jennifer N., Culturally Responsive Poetry: The Lived Experience of African-American Adolescent Girl Poets, Ph.D., Curriculum and Instruction, University of Maryland College Park, 2010. Williams, Asha-Lateef, IDEA Part C Referrals, Determination of Eligibility, and Services Recommended for Infants and Toddlers Affected by Illegal Substances: A Policy Implementation Study. 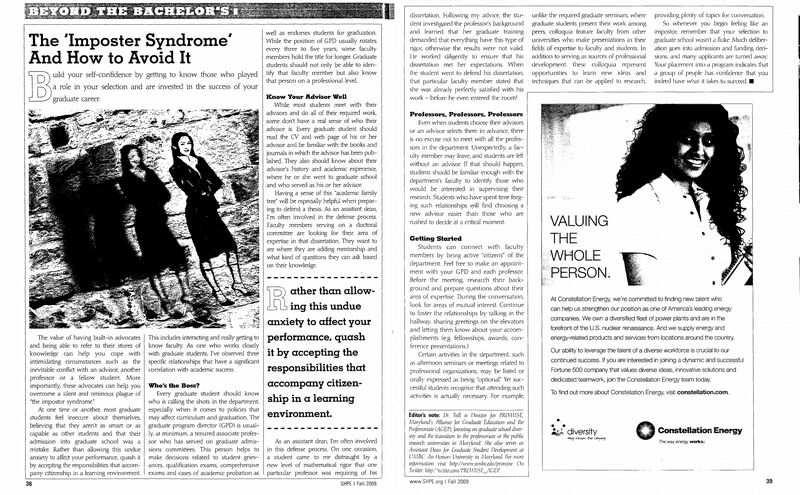 Ph.D., Special Education, Univ. of Maryland College Park, 2010. Mozie-Ross, Yvette D., An Examination of High School Graduates Who Identify Teachers as Influential in their Choice of College, D., Higher Education, Policy, and Leadership, University of Maryland College Park, 2011.